Some children show signs of anxiety when separated from their parents for any period of time. Mohacsy (1976) argues that children typically begin a process of slowly separating from their mother or primary caregiver by the time they are three years old. Perez-Olivas, Stevenson, and Hadwin (2008) emphasize that separation anxiety disorder (SAD) is one of the most common childhood disorders in children younger than 12 years old. Manifesting symptoms of separation anxiety are categorized as a disorder when they meet certain criteria such as intense feelings of anxiety above and beyond what is expected for the child’s developmental age at separation from the mother, which may in turn result in significant academic, social, and occupational impairment. Multiple empirical studies have found a combination of a biological predisposition in the child (triggered by the environment) and parental anxiety (that precedes the child’s birth) as possible variables leading to the diagnosis of SAD. A child’s biological predisposition for anxiety is believed to be impacted by a sequence of events that may begin in the womb during fetal development. The womb is considered part of the environment. Maternal stress during pregnancy, such as preoccupation related to parenting skills; doubts about becoming a parent, apprehension about the relationship with the baby’s father, are all environmental factors that may play a role in fetal development (Santrock, 2011). Mills et al. (2007) propose that parental overprotection may be an attempt toward exerting psychological control over one’s children, which seems to be triggered by the parents’ own psychological instability, not necessarily their wish to nurture. Based on research studies by and large, parental overprotection appears to be a strategy applied by parents driven to protect themselves from their own feelings of shame and inadequacy on how they perceive their own parenting skills (Mills et al., 2007). Although fathers may overprotect their children, most parents who overprotect their youngsters are mothers. Most primary caregivers are mothers. Levy (1943) defines maternal overprotection as the mother’s excessive interaction with her children to the point of preventing them from developing their own self, and instead be motivated to keep the children in an infantile state for as long as possible. Levy suggests that the mother’s own insecure attachment during her early years may be playing a significant role in how she may be motivated to overprotect her children. In agreement, Dallaire and Weinraub (2005) argue that “Bowlby’s theory of attachment provides a theoretical framework to understand the etiology of separation anxiety” (p. 394). Although many people automatically associate the word “attachment” with a secure bond, that was never Bowlby’s intention. Bowlby (1969) argues that attachment, which describes an emotional bond between an infant and his or her mother or primary caregiver, needs further qualification (secure or insecure) (Bowlby, 1969). Both dynamics—secure and insecure attachments exist on a continuum (Bowlby, 1969). Secure attachment tends to develop from reliable caregiving while insecure attachment is likely triggered by inconsistent care. Insecure attachment is typically manifested through feelings of anxiety, avoidance and ambivalence. Scholars suggest there is a correlation between insecure attachment, maternal overprotection, and SAD. Sandtray is a nondirective, intuitive, metaphorical method of psychological intervention, which focuses on the sandplayer’s internal processes believed to be enacted in the sand (Bradway & McCoard, 1997). Most cases of SAD are diagnosed when children start school. 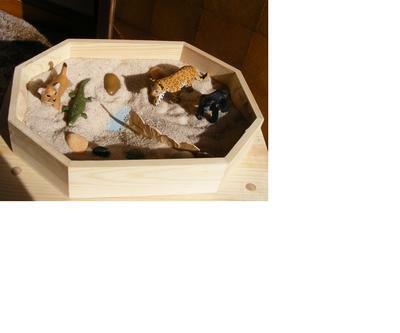 Sandtray is used with children older than six years old and adults of all ages. Sandtray therapy extends sandplayers an opportunity to create a scene in the sand and express feelings about the process. Riveting with metaphors, a crocodile in the sand next to a miniature representing the child may symbolize his or her perception of having an overbearing mother (Chevalier & Gheerbrant, 1969). Building a scene with fences and placing the miniatures at a very close proximity to one another may reveal a parent’s tendency toward excessive control. Based on empirical data, parental overprotection does not automatically mean nurture and “attachment” does not necessarily describe a secure emotional bond (it may or may not). Parental overprotection and insecure attachment are positively correlated with each other. Intervention through sandtray provides children suffering from SAD with a safe forum where they can express themselves and begin forming their own separate self from their mothers. Through building a scene parents also have an opportunity to get closer to the self they may be trying to hide from themselves. It is incumbent upon counselors to dig deep into the parent-child dyad and not simply accept SAD as a child’s issue without analyzing the parent’s history. Overprotection is an example of acting out one’s unacknowledged history. Sand it out versus acting out. Bowlby, J. (1969). Attachment and loss. Vol. 1: Attachment (2nd ed.). New York, NY: Basic Books. Bradway, K., & McCoard, B. (1997). Sandplay – silent workshop of the psyche. New York, NY: Rutledge. Chevalier, J., & Gheerbrant, A. (1969). Dictionary of symbols. Buchanan-Brown, J. (trans.) (1994). New York, NY: Penguin Books. separation anxiety. Attachment & Human Development, 7 (4), 393-408. Levy, D. (1943). Maternal overprotection. New York, NY: Columbia University Press. Mills, R., Freeman, W., Clara, I., Elgar, F., Walling, B., & Mak, L. (2007). Parent proneness to shame and the use of psychological control. Journal of Child and Family Studies, 16 (3), 359-374. Mohacsy, I. (1976). Fusion and anxiety: Children’s drawings and renaissance art. Journal of American Academy of Psychoanalysis, 4 (4), 501-514. Perez-Olivas, G., Stevenson, J., & Hadwin, J. (2008). Do anxiety-related attentional biases mediate the link between maternal over involvement and separation anxiety in children? Cognition and Emotion, 22 (3, 509-521. Santrock, J. (2011). Life-Span development (13th ed.). New York, NY: McGraw Hill.